Course fees: $1600 MR inclusive of GST. 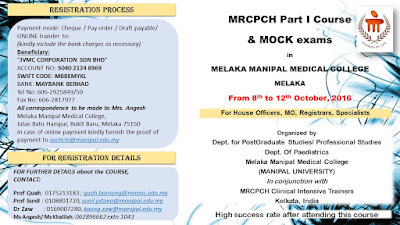 The Department of Post-Graduate Studies, Melaka-Manipal Medical College (MMMC), is proud to inform that an MRCPCH Part 1 course will be held, from 8 to 12 October 2016, in the MMMC campus. The course will be conducted over 5 days, from 9 am to 5 pm, by a team of highly experienced practising clinicians from the “MRCPCH Clinical Intensive Training Course” in Kolkata, India. 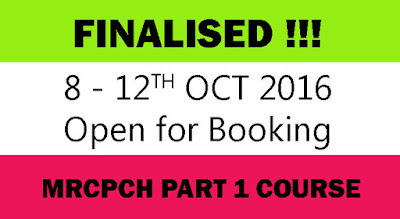 They have conducted the MRCPCH course regularly in India and other parts of the world. All the trainers have worked in the United Kingdom (UK) and have a wide experience of medical practice in the UK. 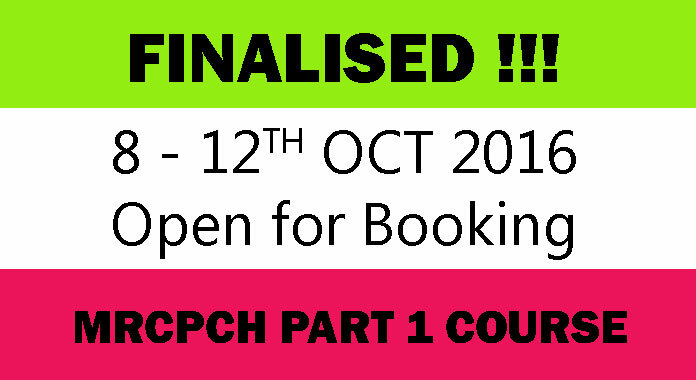 The course will focus on preparing candidates for the first part of the MRCPCH written examination that is Foundation of Practice, and Theory and Science. The faculty will discuss the structure and syllabi of this theory examination including samples questions, and a mock examination will also be conducted. The MRCPCH is an internationally recognised qualification in child health, giving the holder a specialist status. Those interested may contact us for more details. Click HERE to download flier for the course.